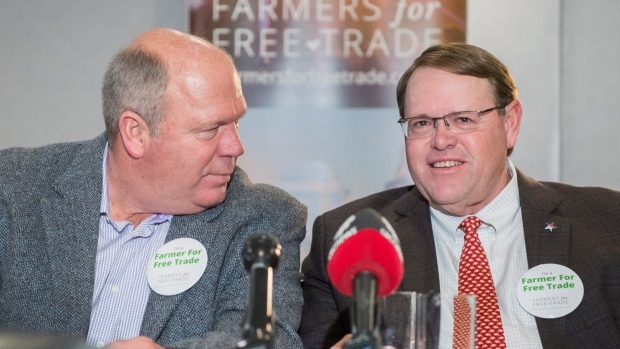 MONTREAL -- A group of pro-NAFTA American farmers descended on Montreal on Friday and expressed cautious optimism that a deal will be reached, despite unresolved issues at the negotiating table that include Canada's supply management system. U.S. President Donald Trump has described Canada's protectionist policies for dairy, poultry and eggs as unfair, and people close to the NAFTA talks have indicated that more access to Canadian dairy market is a key American demand. As the sixth round of negotiations continued at a nearby hotel, member of Farmers for Free Trade stressed the importance of exports to American producers and expressed hope for a quick resolution on the file. Former chief U.S. agriculture negotiator Darci Vetter said that while the highly protected agriculture sector is always contentious, other recent free-trade agreements have shown the issue isn't insurmountable. Canada's free-trade deal with the European Union and the recently revised Trans-Pacific Partnership agreement have showed the country is willing to compromise on the sacred cow of supply management, she said. "What used to be the uncrossable barrier of putting dairy in a trade agreement was crossed with the agreement with the EU and certainly the TPP package," Vetter said in an interview following a press briefing at a downtown hotel. "So there are examples this can be done. The question is how, at what level, and over what period of time." The revised TPP deal struck on Tuesday included a concession on the supply-managed dairy sector, which is to be opened up by 3.25 per cent to foreign competition. Vetter, a consultant for Farmers for Free Trade, said it's "not unreasonable" that the United States would ask for access to the dairy market as part of a revised NAFTA. She added that negotiators for all sides are very familiar with each other's positions and what is possible. "Hopefully the negotiators will have a pragmatic discussion about how we get there, understanding the political pressure is high," she said. Kansas cattle and hog farmer Terry Nelson said Trump's recent comments to CNBC, where the president suggested the United States might enter the TPP if it got a "better deal," are a reason for optimism and a sign Trump has been listening to his pro-trade agriculture secretary, Sonny Perdue. "We've got a lot of faith in President Trump being willing to listen to agriculture," Nelson said. "I know Secretary Perdue has had a lot of conversations that have finally been acknowledged and...I think we're going to be all right." All the members of the group present at the meeting stressed the importance of bending Trump's ear to the needs of the agriculture sector and its importance to his conservative rural base. They also pushed for a quick resolution to the talks, noting that the uncertainty of the protracted negotiating process could harm the export-dependent sector. "We don't know quite where the end of the road is or where it will be...but it will probably put a little drag on exports of both meat and grain," Nelson said. The NAFTA negotiations are scheduled to conclude Monday.